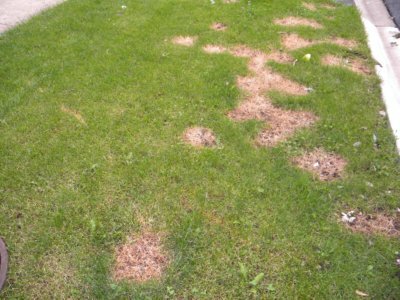 Lawn damage is very easy to misdiagnose. A common mistake homeowners make is to rush to judgement on the reason for the damage. It often resembles other lawn problems such as: lawn weeds, lawn pest problem or lawn disease. When in reality it was caused by a piece of machinery, a chemical, dog urine, animals or salt. Your lawn can withstand some damage. However, serious damage can lead to bare spots in your lawn which is an invitation for those pesky lawn weeds to move in. There are basically two causes for muffler burn to your lawn. You are mowing the lawn on a dry, hot day. You stop mowing but leave the lawn mower running. A few minutes later you continue mowing but the damage has already occurred. The muffler on your mower has caused burn marks on your lawn. You back your car into a parking spot and the back end extends over a grassy area. You leave the car running and the muffler leaves burn marks on the grass. If this happens, the grass will usually green-up by itself within a few weeks. If it doesn't you can repair the lawn. Follow the instructions outlined in planting a lawn. There are basically 4 ways that chemical burns can happen. You are filling your fertilizer cart on a grassy area and you accidentally spill a large amount of fertilizer in a small area. You are using either a herbicide or a pesticide and you accidentally spray excessive amounts in a small area. You are filling the gas tank of your mower on the grass. You accidentally spill gas on the grass. For safety reasons you should never fill the gas tank on the lawn. If you have a chemical burn, the grass will look streaked and appears to be bleached, yellow, brown or dead. If you spill herbicides or fertilizer on your lawn drench the affected area with water. If you spill oil or gas on your lawn, first drench the area with soapy water. Then liberally soak the area with water. This may help limit the amount of damage to your lawn. The only way to fix the damage caused by a chemical burn is to repair your lawn. Follow the instructions outlined in planting a lawn. I asked an employee to spray the weeds in the cracks of the driveways and sidewalks. A resident of the homeowners association started talking to my worker about a lawn care related problem near his townhome. The two of them were standing on the grass. My worker didn't realize it, but he had his finger on the sprayer trigger and the chemical was leaking onto the grass. A week later, there was a 3 foot by 3 foot patch of grass that was dead and in need of immediate repair. It wasn't hard to figure out what happened. While dog is considered "man's best friend", they can be destructive to your lawn. Typically young dogs under the age of 3 will dig up your yard. However, you may have a dog that likes to bury toys, bones, etc. As the dog matures this may end. Training the dog helps or for extreme cases you may need to take your dog to obedience school. If your dog tends to be a digger, don't leave him/her unattended in your yard for very long. Your dog, usually a female, urinates on your lawn. Due to it's high nitrogen content the urine acts like a fertilizer to your lawn. However, too much in one spot can burn your lawn. The lawn appears to have dark green and brown spots in the affected areas. It can easily be mistaken for brown patch, dollar spot or even grubs. I have two female dogs so I have seen this happen first hand. Whenever possible, to prevent lawn damage take the hose and water down the affected areas. This will dilute the urine and limit the amount of damage to your lawn. Create an area for your dog to go to the bathroom and train the dog to use this area. As with other types of lawn damage you may have to repair the affected area. Follow the instructions in planting a lawn. One of the benefits of having your own backyard is that it is a safe haven for your children to play and a place to spend quality family time. The problem is the constant trampling across the yard can stress your lawn and cause damage. Use hearty grasses that can withstand traffic. Cool Season Grasses - Use a mixture of tall & fine fescues and Kentucky bluegrass. Warm Season Grasses - Use a mixture of Zoysia grass, Bermuda grass and Bahia grass. Mow high to reduce the chances of lawn weeds, lawn pests, lawn disease and drought. Water deeply to keep the grass blades strong and healthy. If you have a swing set, consider putting sand in the area rather than grass. My son enjoyed camping out with his buddies. They would set up the tent and campout in our backyard. Unfortunately, keeping the tent up over extended periods of time can cause severe lawn damage. Pay close attention to your lawn maintenance practices during the height of the summer when there is extreme heat and/or drought conditions exist. Make sure the blades on your lawn mower are sharp. Dull blades rip the grass leaving it susceptible to lawn problems. Cut back on the watering before drought restrictions are imposed. This gets your lawn used to the lack of water. Water only the areas of your lawn that dry out the fastest (i.e. high spots, slopes and areas near the pavement). This stage is a natural way for your lawn to avoid stress. Looks dead (a grayish or brownish color). Don't fret, remember your grass will recover when the moisture returns. A lawn can go dormant for as long as 2 - 3 months and still recover perfectly fine. Water deeply to help the grass recover and grow. When the grass greens-up fertilize it. If lawn weeds appear, use a weed and feed. Unfortunately, sometimes mother nature has to flex her muscles and let us know who is really in charge. Flooding and hurricanes can lead to excessive amounts of water on your lawn. Too much water is as bad as too little water. It can lead to erosion, debris deposits and extended periods where your lawn is under water. The treatment depends on several factors: length of time the lawn is under water, the amount of debris on your lawn and the temperature outside. Lawns that were flooded for only a few days, have less than an inch of debris on them and the temperature outside is cooler (usually less than 60 degrees fahrenheit) have the best chances of recovery. When the grass begins to look normal again, use a good lawn fertilizer. If the area was flooded with salt water, be sure to use fresh water from the garden hose to get rid of the excess salt. If the water wore away the soil be sure to add new soil and organic matter to improve the quality of the soil. The damage occurs during the winter when the streets, sidewalks and driveways are salted to eliminate the ice build-up. Visually, you don't see the damage until the spring when the grass greens-up. Salt damage causes the grass to turn brown in areas along the street, driveway and sidewalk. To avoid this type of damage, don't apply the salt along the street, sidewalk or driveway. Instead apply it along the middle of the pavement. Avoid using products that are made with sodium chloride. Instead use products that are more plant friendly such as potassium chloride and calcium chloride. Calcium chloride products are plant friendly, pet friendly, pavement friendly and usually more expensive then their counterparts. However, in the long run the extra expense may be worth it because you will not have to bare the expense to repair your lawn. When the grass begins to green-up in the spring, dilute the salt affected areas with water. If necessary repair the lawn, follow the instructions outlined in planting a lawn. Return from lawn damage to Lawn Care Made Easy Home Page. Do you want your lawn to look like a Wally Lawn? Subscribe to Wally Lawns and you will receive information about new pages on the web-site, tips and tricks as wekk as information on new techniques and trends in lawn care delivered right to your INBOX on a monthly basis. 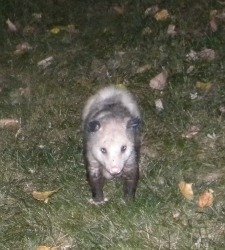 An opossum by night is a hunter searching for dinner. On tonight's menu we have lawn grubs. 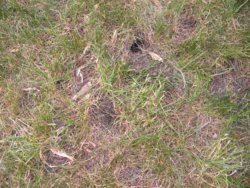 Lawn damage caused by animals digging up grubs. On the surface, our little Koda looks so cute with those ice blue eyes. She is a great dog, but boy does she have her moments. Don't cross her. When she was younger, If you did something that she didn't approve of (like ignoring her), she would make you pay. 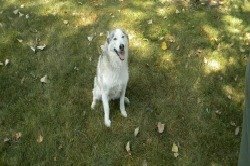 All it would take is 10 minutes in the backyard alone and she would dig the yard up. Her nickname is "Dennis the Menace". Thank goodness she has outgrown this stage.